Taste test: These are very good barbecue chips. The first thing I noticed upon opening the bag was the very dense coating of flavor powder. There's a lot of powder on these chips, and it does stick to the chips  unlike some other heavily powdered chips, such as Boyer's, where the powder doesn't stick and gets all over you. These are fairly thick and have a very soft crunch. The flavor is sweet, tasty and intense when you first bite in, but then it surprises you with a moderately hot aftertaste that lingers for quite a while. Very good. Smell test: Strong barbecue aroma, a bit hot. 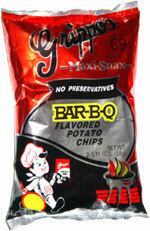 Company: Grippo Potato Chip Co., Inc. 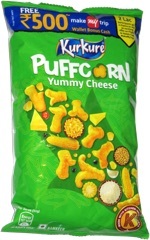 This snack was discovered by Jeremy at BP gas station, Covington, Kentucky. Review published .